I cannot possibly describe how excited I was to finally receive my copy of The Ocean at the End of the Lane, by Neil Gaiman. This book was an immense relief to me. I started reading it and was immediately sucked in and I realized that, phew, I really do still love reading and I was just waiting for the right book to remind me of that. And here it was! The Ocean at the End of the Lane is not a long book. I read it in one day and I am sure you speed readers out there could read it in just a few hours. But its length is deceptive. Even now, days removed from reading the book, I am still thinking about it and haven't really been able to read anything else. It's one of those books I read and I knew it was good when I was reading it, but I also just was so deep into it that I couldn't take a step back and think about everything going on in it. So I read it and I finished and I thought, "Well, that was different. It was good, but... I don't know that it's amazing." And I closed the cover and went to sleep. Only, I couldn't really sleep. I just kept thinking about the book. And in the morning, I mulled on it some more. And then I read this review and finally, things seemed to click. And I understood that this really is a masterfully told story, just as one would expect from Neil Gaiman. What makes the book so powerful, and what was articulated so well in the NPR book review, was the impact of a middle-aged man remembering what happened to him as a child. The financial difficulties his parents faced and how they dealt with them, his father's sudden flare-ups of temper, a terrifying moment in a bathtub, the fragility of relationships when the people in them have had to bend too far not to break. How does a seven-year-old make sense of the world and what is happening to him? How does a middle-aged man look back on his life and what he made of it, permanently changed by occurrences he only sometimes remembers? So much of Gaiman's work is about the choices we make and the consequences of those choices - how do we weigh what matters most to us, and who are we to decide matters? How does what we do affect others? And do we ever really deserve what happens to us, good or bad? We spend so much effort trying to make sense of our lives and justify what we do. In The Ocean at the End of the World we see that from the perspective of both a child and an adult. And as an adult looking back on his childhood, the narrator gives us enticing glimpses of a life and a family that were not as idyllic as they seemed. In a way, this book is textbook Neil Gaiman. The language is so beautifully subtle and evocative. The setting is described in such a way as to put you right in the thick of things, and the action moves so smoothly and yet is so, so scary. In another way, this book is a departure for Gaiman. In Neverwhere, American Gods and The Graveyard Book, the hero is very much someone you get to know and love. In The Ocean at the End of the Lane, you are not quite sure how you feel about the narrator. You know what he was like as a child of seven - lonely, quiet, and scared - but you don't quite know what he's like as an adult. And that moral ambiguity - the uncertainty that the boy grew up to become a man who was worth all the effort - is really the lynchpin of this story. Our friends and family put so much effort into our well-being when we are young, hoping that their efforts will make us into good, productive people when we grow up. That their investments will be worthwhile. But we are nothing if not flawed, and the struggle to live up to those dreams and expectations is something we all deal with. And it's something that Gaiman articulates so brilliantly - and so very, very subtly - in this novel. I can't wait to read this one. I also want to read Neverwhere again just because it's been so long since I last read it. And American Gods which is probably my favourite of Gaiman's books. I want to read Neverwhere again, too! I saw a play version of it last year or the year before and it reminded me of how great it is. I will be meeting him on Monday night and then reading the book and I CANNOT WAIT. I've yet to read the NPR review (about to click over), but I can honestly say yours is my favourite review so far, Aarti. It's a very soul-searching sort of book, isn't it? I loved how it highlighted that adulthood doesn't necessarily mean having all the answers - perhaps it's only making peace with the choices we made and the paths we followed. Aw, thanks, Ana! Yes, soul-searching is a good word. An inner ache sort of book. My copy arrived yesterday - I hope I can fit it in soon. I am really looking forward to it after your review. I can't wait to see what you think! I am going to have to steal this book from my daughter, who is reading it in the evening, when she doesn't have it in her hands. A terrifying incident in a bathtub? Yes, it really is quite scary! Ohhhh I need to borrow it from the library! I am extremely excited to read this book! This would definitely be a good choice for anyone in a reading slump. I noticed about 2/3 of the way through that I hadn't felt like there was a single lull in the story. I think there ended up being maybe two pages toward the end that lost my attention for a moment but that was it. I was sad when I saw how short the book was but when I finished it, that was one of the things that I really appreciated because it was so tight. I just caved and bought it. I couldn't wait any longer after reading your review! I do love Gaiman's writing so much. I cannot wait to read this book! It sounds amazing! I love your review, Aarti! 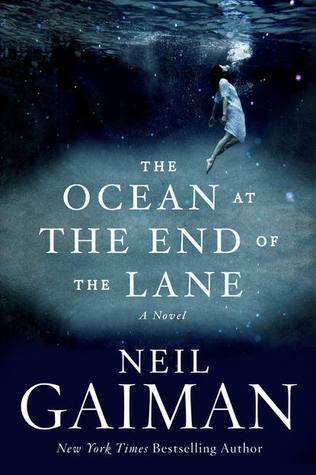 You are so right - Gaiman has readers wrestle with so many questions in this book about life and choices. What did you think of the Hempstock women? I absolutely loved them and want more of them. I read this book last week and decided to reread it. I'm still thinking about it especially the ending. I tried starting it today, and I don't know. All that magic stuff. I couldn't deal with it! I cut out after the worm in the foot thing.